We hadn’t planned going to this beach this early, having just arrived at Romblon town at 6 AM. Our initial plan was to catch up on sleep in the morning, then head for Talipasak Beach in the afternoon. 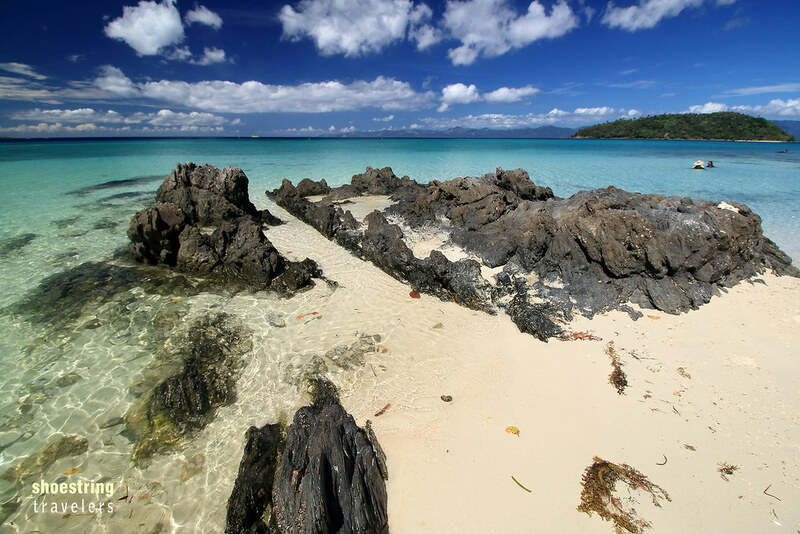 We would then visit three other beaches including Tiamban Beach, on the following day. But a sudden brownout before 9AM changed our plans. It was unbearably hot in the hotel and with the multitude of beaches nearby we’d be fools not to cool off at these, so off to Talipasak we went. After lunch and with our stay at Talipasak Beach over, we didn’t relish the idea of going back to our hotel in town, not knowing if the electricity was back. Our trike driver and guide suggested we drop by Tiamban Beach which was right along the very same road going back to town. 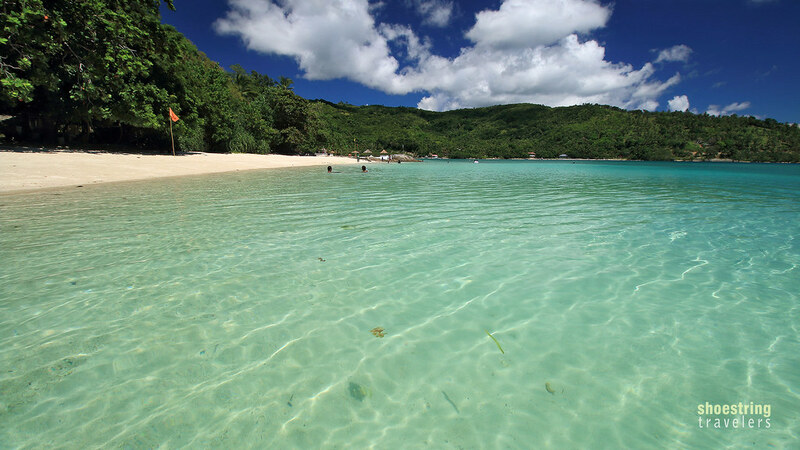 15-20 minutes away from Romblon town proper, Tiamban is actually closer to town than Talipasak Beach. Tiamban has a private beach resort with day cottages and even rooms for overnight accommodation. After paying the P40 entrance fee and P90 for a table and 4 chairs for our small group we quickly chose a shaded spot by the beach. With a heavy canopy of trees along the whole beach front, Tiamban has an abundance of shade – something that we sorely needed on this hot summer afternoon. 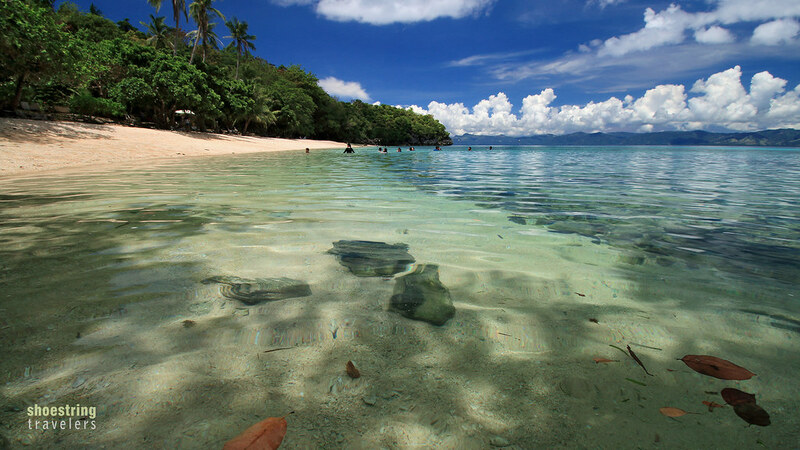 Tiamban Beach is just 15-20 minutes away from Romblon town proper. 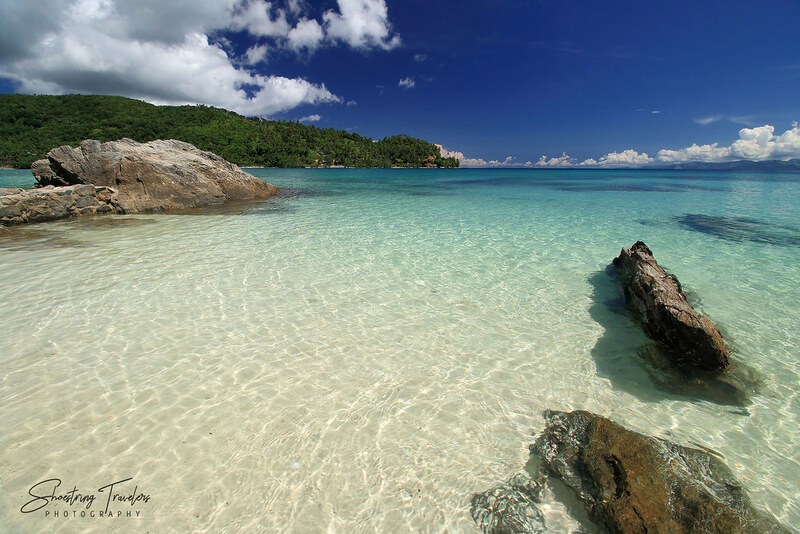 Tiamban’s fine white sand, clear turquoise waters and a gradually sloping sea bed was just too inviting for us to spend our whole time under the cover of the trees, however, and we were soon frolicking in the glassy blue-green waters. 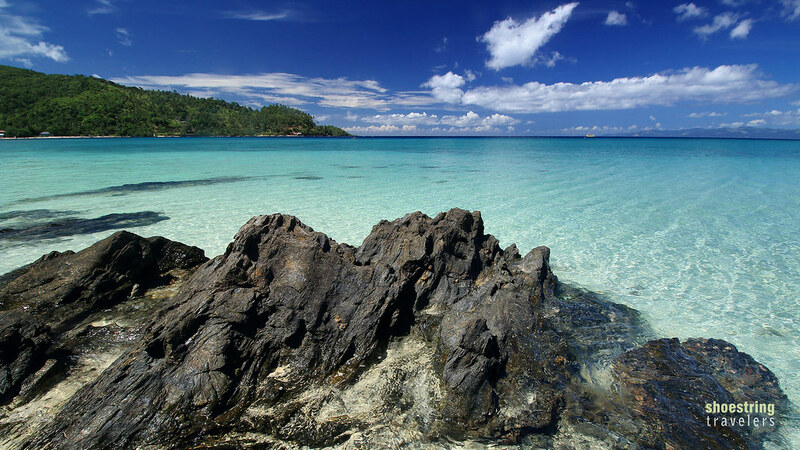 Tiamban’s waters are so inviting; the sea bed slopes down gradually making the beach perfect for swimming. We’ve been fascinated by Romblon’s white sand beaches for some time but didn’t realize it was this beautiful from up close. Still quite pristine and with a resort that has pretty much preserved the natural beauty of the place, Tiamban is just one of the many beaches on the island where we could bum around the whole day and not get bored. Looking out to sea from the western section of Tiamban Beach. The eastern and western extremities of Tiamban contain interesting rock formations. While coral reefs are located quite a distance from the shoreline, these rocks sometimes hide a few fishes. We had a nice chat with some locals who were fishing in shallow waters and actually caught a few medium-sized fish. Later we caught sight of a small school of fish doing acrobatic jumps in the water, no more than 20 meters away from shore. There’s actually a small fishing community by the beach near the eastern end of Tiamban, its newly painted boats glistening in the bright sunlight. To live at this beach and see a slice of paradise every day is a dream for us visitors but the locals are so used to these sights that it’s no big deal for them. Rock formations mark the boundary between Tiamban and Margie’s Beaches. 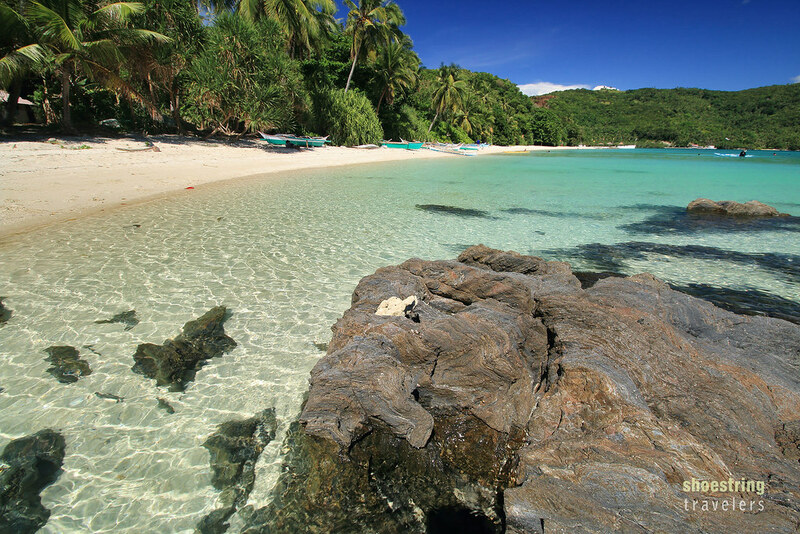 A smaller beach lies in close proximity to Tiamban, separated from the latter only by a few large rocks. We easily got there on foot and noticed that while it is not well-maintained compared to Tiamban – there were a few debris carried over by waves on the sandy beachfront – the waters are clear and quite clean. This beach has been christened Margie’s Beach and how it got its name we’re not very sure. We heard from one of the locals that it was named after the person who bought it but we can’t vouch for that. Like Tiamban, Margie’s also contains beautiful rock formations. 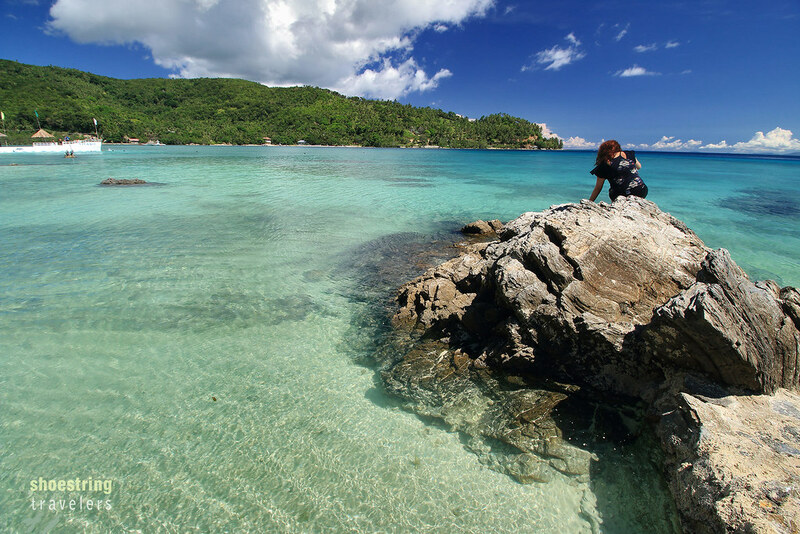 It’s still pristine and appears to be a good snorkeling area with rocks and corals not too far from shore. From what we know, Margie’s is a public access beach which explains why many locals are swimming on this beach and have set up their stuff several meters inland. 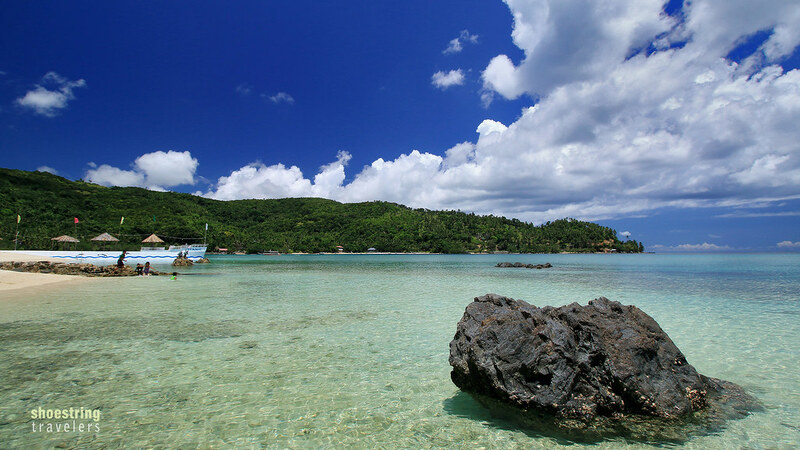 Tiamban and a few other beaches in Romblon town are just a few kilometers away from the town proper. We only needed a 15-20 minute trike ride from town – all of it along paved roads – to get to Tiamban. Trikes usually charge P100 one-way for a group of 2-3 people (our resort person however haggled this down for us). You can arrange for the trike to pick you up and drive you back to town. 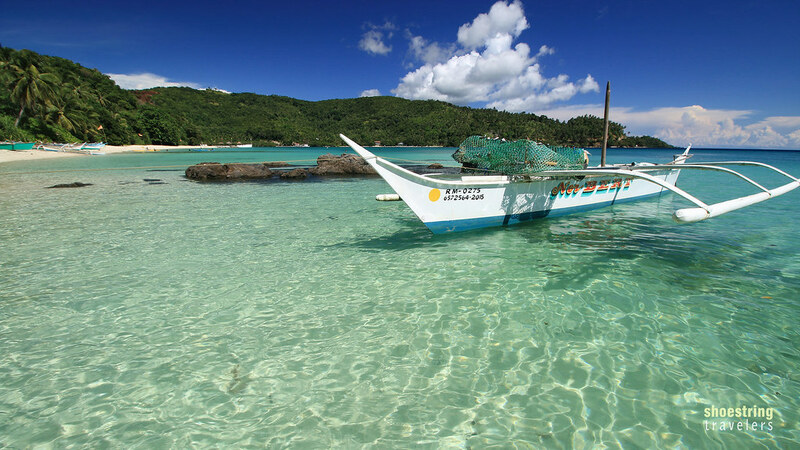 Tiamban is also offered by trikes as part of a whole day tour that includes 4 beaches in Romblon town and other attractions in or near the town proper. The resort in Tiamban charges a P40 entrance fee and P50 for a table and two chairs. Additional chairs for rent costs P20 each. The resort also offers overnight room accommodations for 2 to 4 people in a fan room (P800 – 1,000 per room). It serves drinks and snacks but no lunch or dinner is available at the moment. 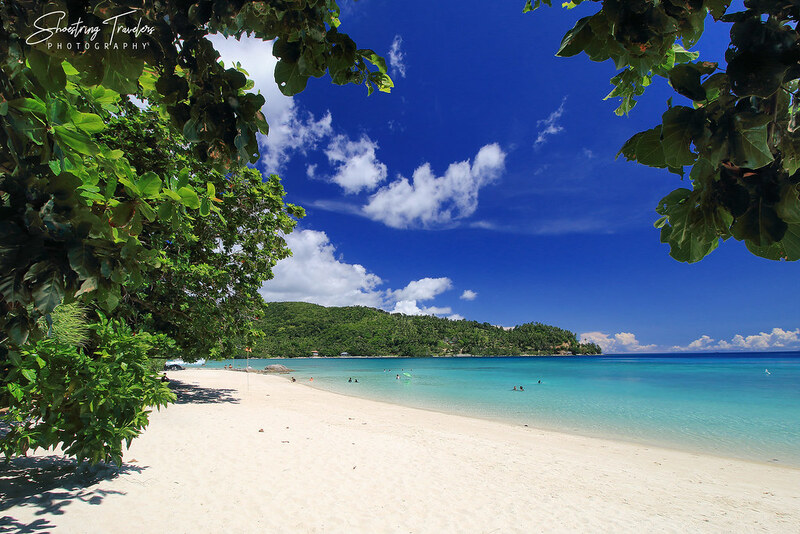 We first saw pictures of Romblon’s pristine white sand beaches more than 10 years ago but it’s surprising to realize that not too many Filipinos or foreign tourists have come this way. Only distant Carabao Island at the southern edge of Tablas Island and just a 1-hour boat ride away from Boracay or nearby Caticlan, has been in the tourist spotlight for some time now. That could change in a heartbeat, however, as our hotel guy told us that the number of visitors this year has suddenly surged compared to that of 2016. 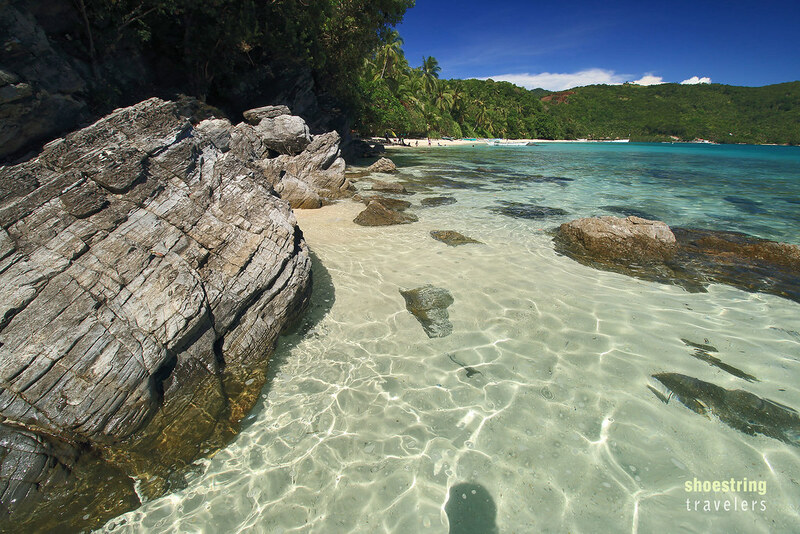 For now though we can still enjoy the pristine and tranquil beauty of Romblon Island and its beaches. For directions in getting to Romblon town please visit this page. 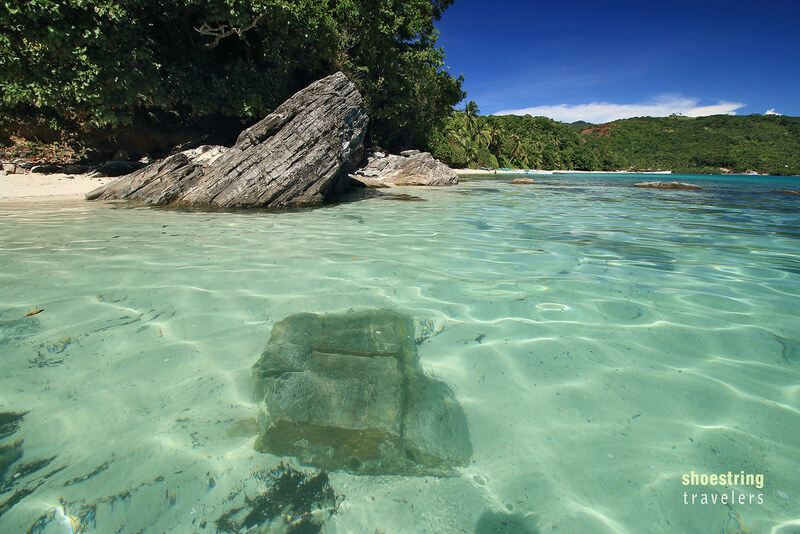 Posted in Romblon, Travel PhilippinesTagged beach, philippines, Romblon, Tiamban Beach, travelBookmark the permalink. Thanks for visiting our blog Ester! Highly recommended! 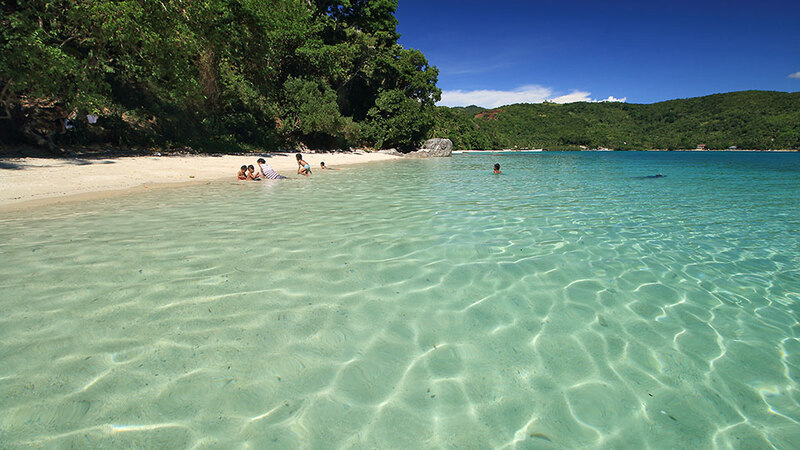 There are also nice beaches in the 2 other islands of Sibuyan and Tablas, all part of Romblon Province. They say Carabao Beach was how Boracay used to look like back in the ’80s. We’ve only been to Romblon Island. 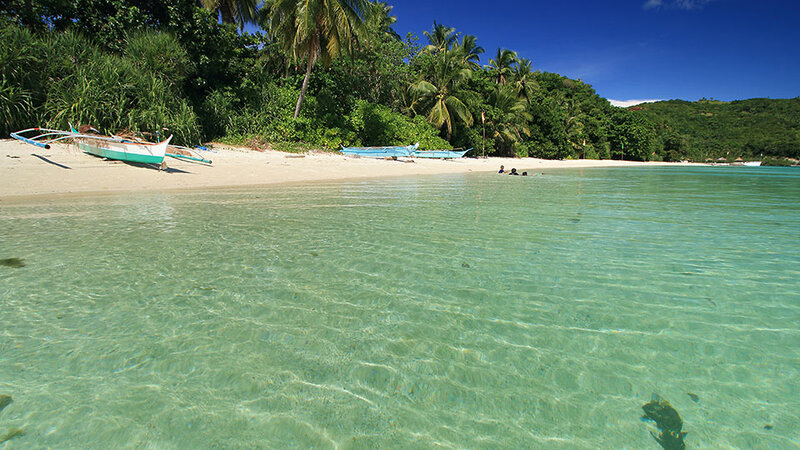 There are other beautiful beaches in Sibuyan and Tablas Islands (both larger than Romblon Island), all part of the province of Romblon. Am thinking of doing Tablas next year maybe. That explains it, the sand is almost identical. Hope to get to see more of Romblon by next year too.